This is extremely interesting— I stumbled upon Part 1 of this post whilst browsing for information about modern data-over-HF (as in 3-30MHz RF, not microwave) and I don’t have any experience in HFT. You’re right that it’s possible to use fibre alongside the HF link to transmit encryption keys, but the availability of a fibre link alongside the HF link allows for far more — you can do protocol negotiations, channel sounding, feedback on data received and RF conditions, and agree what kind of modulation/coding schemes to use for upcoming data (and what transmitted bits are to mean in terms of higher-layer protocol (something about price informations? I don’t know anything about HFT)). The availability of GPS indeed makes time/frequency synchronisation easier (and combined with sounding signals and feedback over fibre), which possibly allows for eliminating latency-inducing complexity in the receiver. It’s a far cry from the traditional data-over-HF scenario, which is assumed only to be relevant when other (higher bandwidth) links such as fibre or satellite or point-to-point microwave are unavailable, so everything gets carried out over the RF channel (look at ALE). Eric – my best guess at costs and time for the two solutions are $200M and 3 years for VSN satellites versus $10M and now for shortwave. 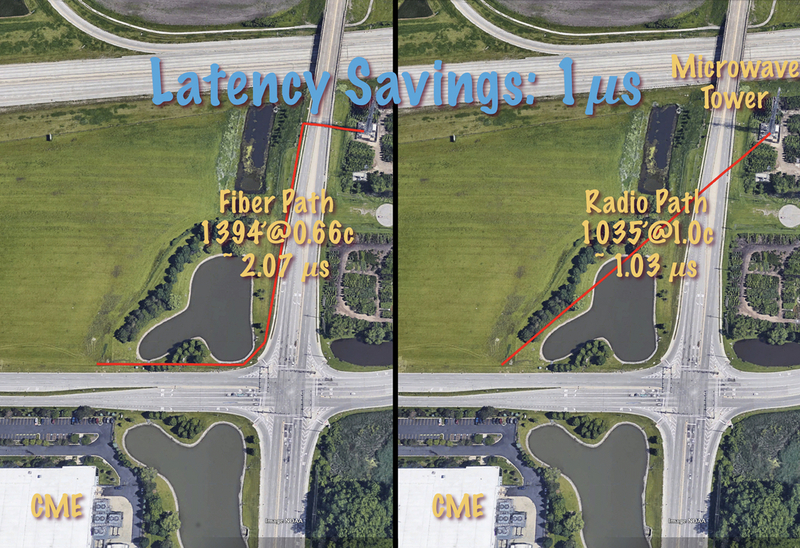 Where VSN would outperform shortwave is bandwidth. Sent from my iPhone – sorry about the brevity and any typos. Yes, this is an important point that I didn’t make in the article. Some percentage of the work in running any link goes into maintaining the link itself. Framing, start bits, stop bits, ACKs, negotiations, etc. Having GPS clock sync and the perfectly reliable and secure fiber link between endpoints means only the latency-sensitive bits have to go over the air. OK, that’s one end of the circuit, the Chicago end. Now what is known about the EU end or ends? I’m assuming not only London, but Frankfurt, Paris etc. If some ideas about possible locations are available may be some visual mast hunting can take place. 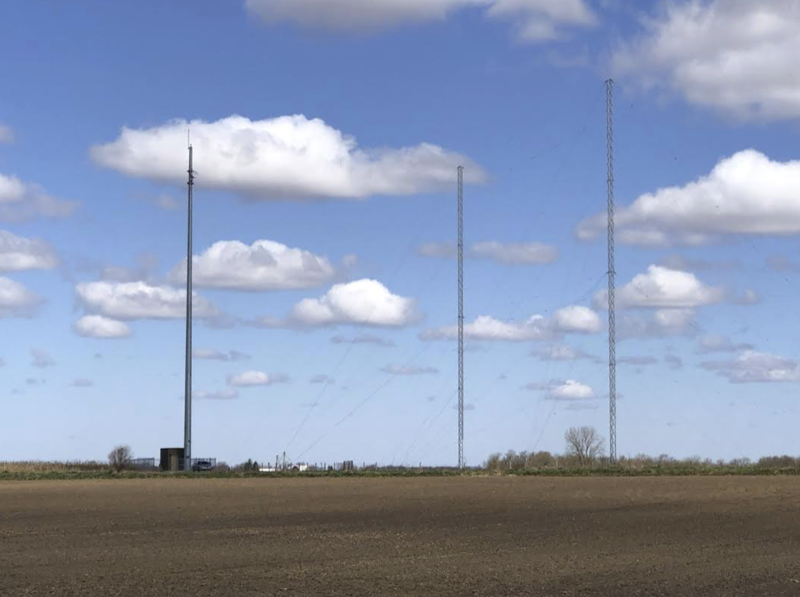 Masts and antenna like seen in your posts would require planning permission, the local planning authorities are very much interested in masts and antenna as the UK amateur radio community will well agree..! I should also say that there are large areas of the world outside of USA/Canada and Europe where there is no fibre including all the islands in the Pacific Ocean. I live in NJ. Where should I look? I’d love it if somebody would keep an eye on this site: 293–315 US Highway 9W, Closter, NJ 07620. It may actually be in Alpine NJ. At least it was the Alpine police who chased me out of there when I was taking pictures a couple of weekends ago. I’m interested because the site is licensed for a DRM shortwave transmitting antenna, but it hadn’t yet been built when I visited. 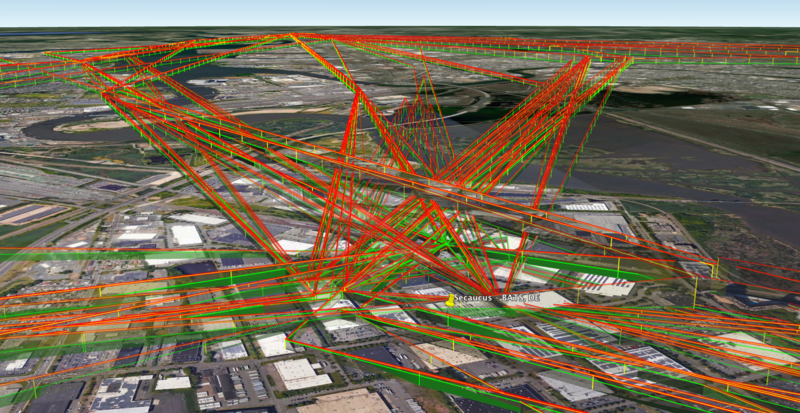 Careful, there are tons of non-shortwave antennas there already that might distract an aspiring antenna sleuth. If built as planned, the shortwave antennas would be two large horizontal antennas attached to the shorter tower with the big white ball on top. I don’t think you can see this shorter tower from the road, so you’d need a drone or a willingness to trespass through the woods to the perimeter fence. I’ll detail my findings about this site in Part III coming soon. You should contact the ARRL IL SM, AD9I. My SM who I’ve been in contact with learned that they have heard nothing about this til now. By pure coincidence I live in Maple Park a few miles from that site and am employed in West Chicago just around the corner from that site. About a week ago while driving through the area I spotted a couple of installations southeast of Elburn that surely are related to this. 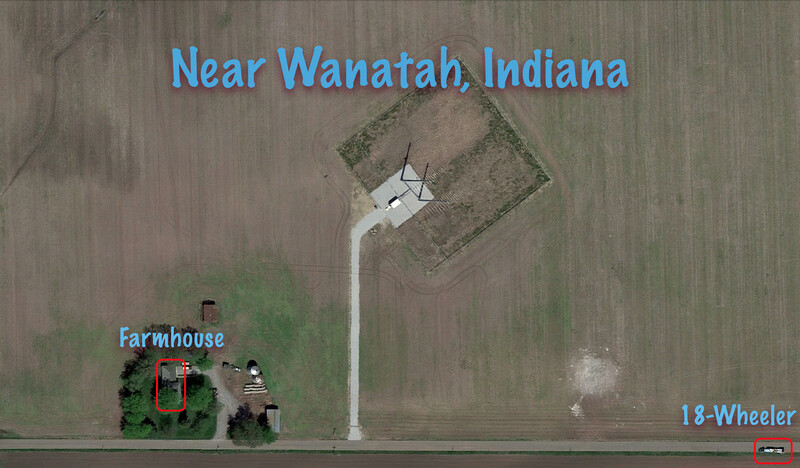 Both are near the intersection of Hughes Road and Bunker Road with the microwave installation being visible to the northwest of that location and the shortwave setup being in a field to the southwest of that location. To see the shortwave installation you may have to travel west on Hughes to see it on the south side of the road. The microwave site is possibly a repeater? It appears to have both receiving and transmitting antennas and if you were to draw a line on a map from the Maple Park site to Aurora it seems to pass right over this Elburn site. 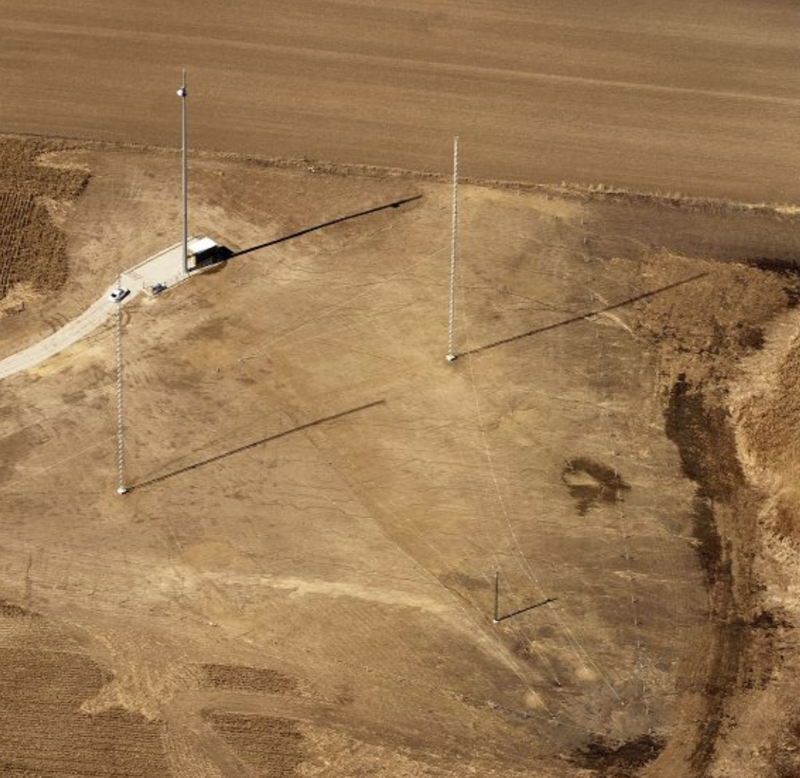 There is another of these HF antennas located near Harter and Perry Roads in Kaneville, Illinois. Thanks Alan. 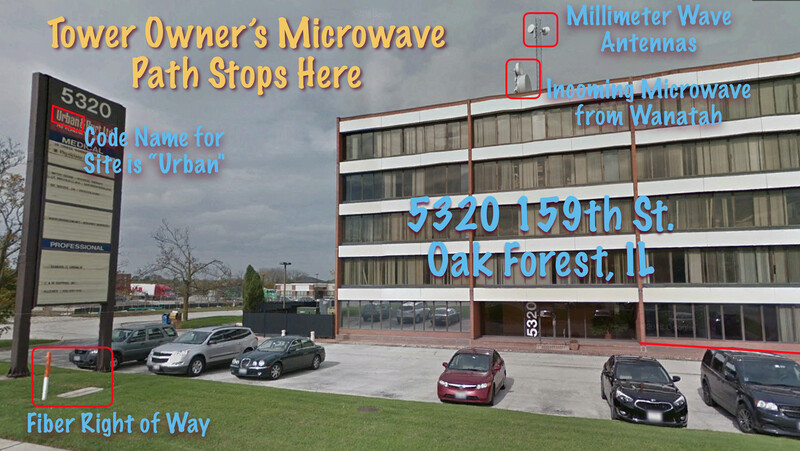 The intersection you mention is very near what I describe as the “fourth Chicago-area shortwave trading site” I found in Part III of the series. I think we’re talking about the same site. Thanks for making sure nothing was missed. Agreed, that is the same site. Interesting stuff! I am working on this stuff currently. I guess I wonder what all the hubbub is about. It’s just another form of communication. Why so much curiosity?